Clinton: Iran continues to threaten Israel, destabilize the region, and sponsor terror"
(CNN) -- Just days before his planned trip to New York, Iranian President Mahmoud Ahmadinejad said he has proof the United States and Israel are linked to the world's leading terrorist organizations, according to state-run media. "We have documents that prove (Washington) is the root of world terrorism," Ahmadinejad said in a speech in Tehran, Press TV reported. "It has been aiding and abetting extremist groups over the past years." Ahmadinejad said his nation "cuts any hand that signs a document against Iran," according to the semi-official FARS news agency. His remarks came as the United States pushes for new international sanctions against Iran over its refusal to halt its nuclear program. The United States "is the only country to have used the atomic bomb in military conflict," Ahmadinejad said Saturday, according to Press TV. "They even admit themselves that they resorted to using (similar weapons) during the war they waged on Iraq." Ahmadinejad planned to offer at the U.N. conference major proposals that would allow Iran to maintain its nuclear program, his top adviser, Mojtaba Samareh Hashemi, said, according to IRNA official news agency. Iran insists that its program is aimed at producing nuclear energy, while Washington accuses it of seeking to develop nuclear weapons. 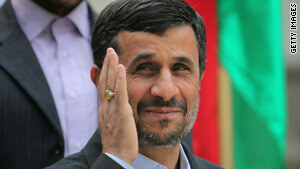 Ahmadinejad urged the United States to engage his government, saying that "companionship is better than confrontation," FARS reported. His remarks came at a ceremony celebrating May Day, or International Workers' Day. On Thursday, Secretary of State Hillary Clinton condemned Ahmadinejad in some of the Obama administration's strongest language to date. "The United States is committed to pursuing [a] diplomatic path," she said. "But we will not compromise our commitment to preventing Iran from developing nuclear weapons."